New student accommodation at the University of Gloucester was officially opened on Thursday 5th April 2018. This exciting new village developed by Uliving, leaders in student living and sustainable construction, comprises 577 new en-suite student rooms, 214 refurbished rooms together with landscaped grounds and a range of social and study spaces. To mark the campus’ 150 year anniversary as an art school, each building has been named after a famous artist, writer or renowned figure associated with Gloucestershire. Names include John Singer Sargent, PJ Crook, Brian Jones, Paul Mason and Robert Raikes. 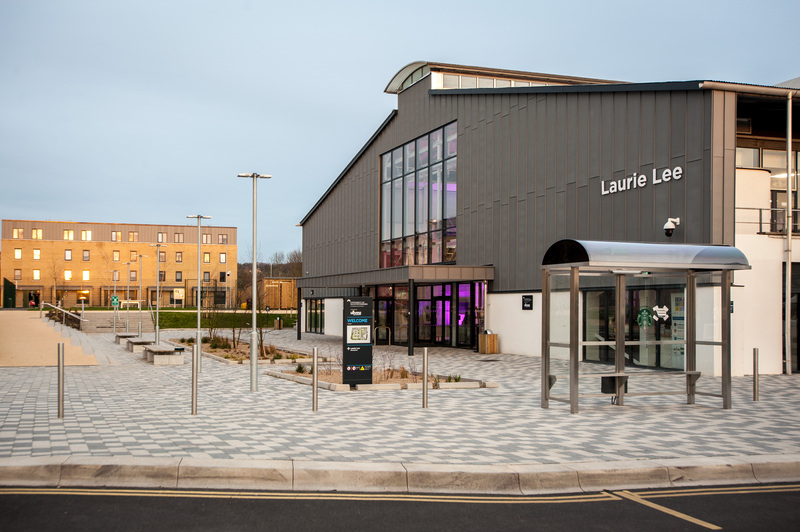 The main block with the bar and refectory is named after writer Laurie Lee. The opening ceremony included a celebratory art display showing both student pieces and contributions from famous alumni. The university’s art collection has pieces by PJ Crook, Cornelia Parker, Peter Thursby and the world-famous ‘The Golden Boy’ bronze bust of former Rolling Stones founding member, Brian Jones. Pittville Student Village will now be the art work’s permanent home, after a lengthy tour of the county. Gloucestershire alumna PJ Crook officially opened the university’s newest student accommodation. PJ Crook is an internationally acclaimed painter and sculptor whose striking work features in collections worldwide. PJ attended the Gloucestershire College of Art and Design, a predecessor of the University of Gloucestershire.